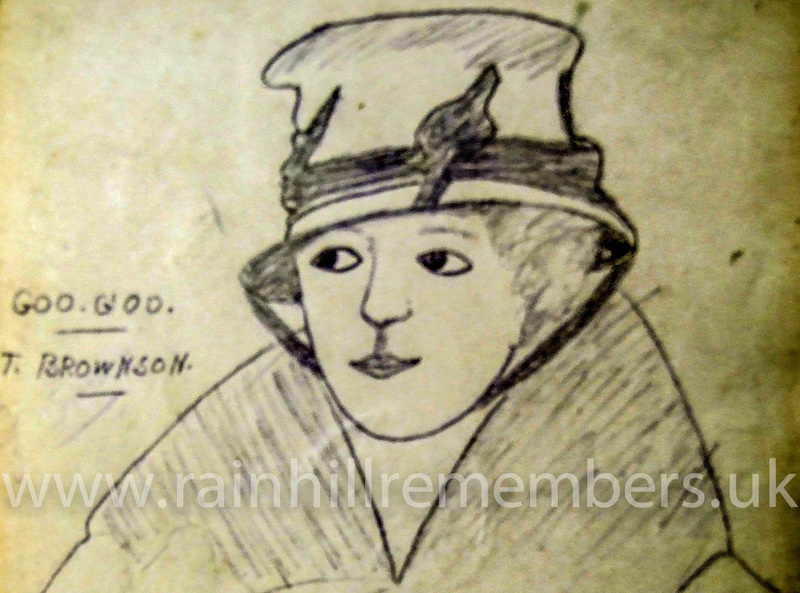 Since Edith's Autograph Book came into the possession of the Rainhill Civic Society Heritage Group, a tremendous amount of work has gone into trying to identify the soldiers who wrote the amusing and uplifting messages as well as the finely detailed drawings. 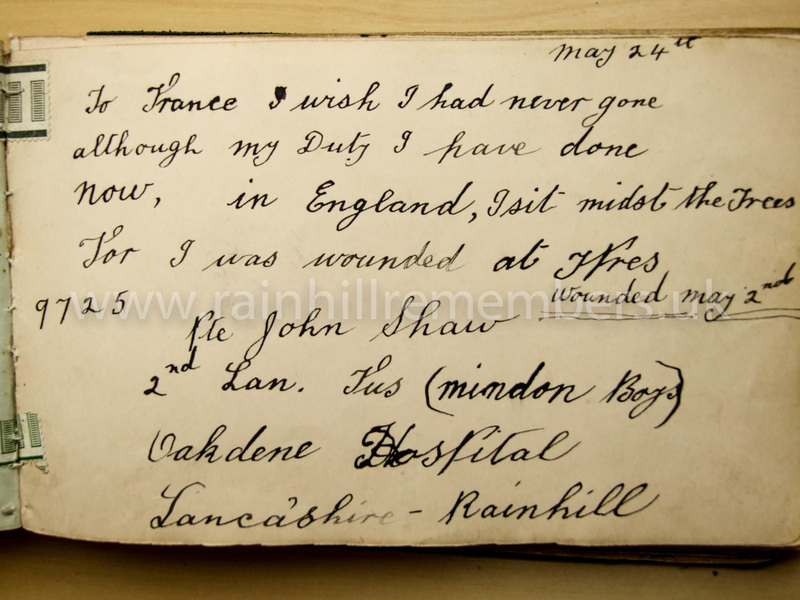 Following several years of research, Rainhill Civic Society has produced a book about the Autograph Book, the soldiers who wrote in it and the VAD hospital in which they were treated. The book was launched on Saturday 10th November 2018, when Rainhill Civic Society organised a concert at the local Ex-Services Club to commemorate the end of the First World War. A packed house was treated to a musical treat and singalong from the Parr Brass Band ending in a rousing chorus of Land of Hope and Glory. 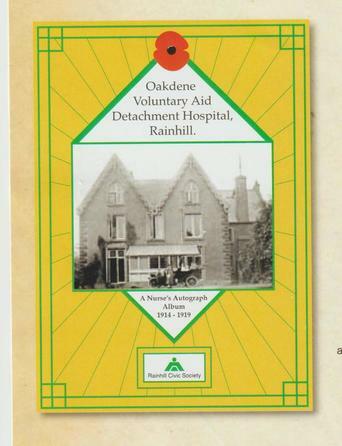 The Rainhill Garrick Society with narration from Ann-Veronica Howitt and Judy Lowe gave a moving tribute to Edith Lidstone and the soldiers who were treated at Oakdene VAD Hospital. The Hi Notes Choir then entertained the audience with a selection of entertaining and poignant songs, ending with a singalong with the audience. The evening was brought to a close by Chairman of the Rainhill Civic Society Colin Ince thanking Roger Phillips from BBC Radio Merseyside for being Master of Ceremonies and keeping everything to schedule and presenting him with a copy of the latest book. Below is a video about Edith and the Autograph Book which was shown at the concert. Edith Lidstone was the 5th of 6 children born to Nicholas John Lidstone. Nicholas was born in Dartmouth in 1844. It would seem that seafaring was in his blood and as he grew up he made a number of voyages to Brazil. There he met and married Isabelle Maria Fonseca Soares. Over the next 10 years their 6 children were born, some in Prenambucob, Brazil and some in Liverpool. Nicholas was described as a Commission Merchant, presumably conducting trade between Liverpool and Brazil. He died on 11th April 1910 leaving £372.0s.6d to his widow. In 1915, Edith was living at Sunnyfield Villa, Archway Road, Huyton, Liverpool with her mother and some of her siblings. 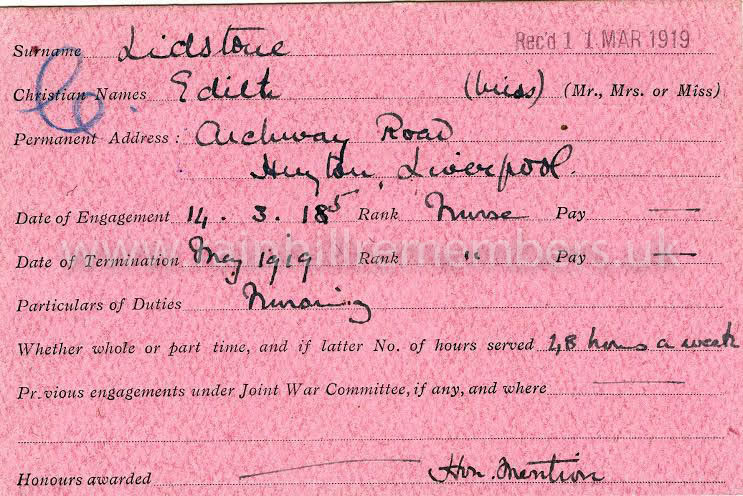 She was aged 38 and unmarried so decided that her 'war work' would be as a Voluntary Aid Detachment (VAD) nurse. 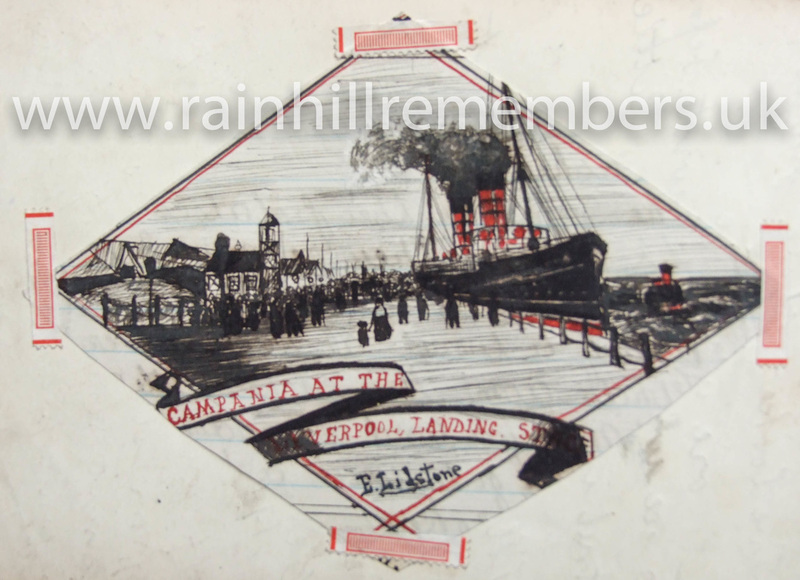 Edith was soon directed to one of the newly opened war hospitals at Rainhill, just two railway stations from Huyton. Here she was attached to Oakdene Hospital, a large private house at the top of Lawton Road which had been put at the disposal of VAD No. 40 by the owner Mr Henry Gamble and was equipped by means of funds and gifts from local residents. 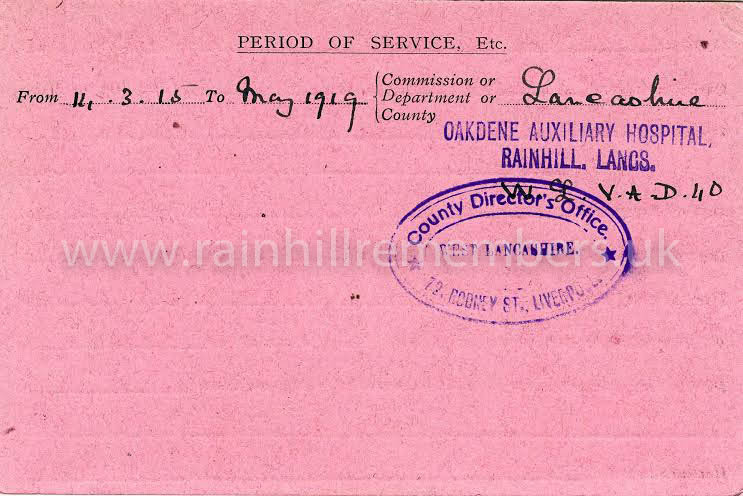 Oakdene opened on 14th March 1915 with 30 beds and Mrs Bishop as Commandant. It was a Class A hospital taking patients direct from Ambulance Trains, France and other theatres of war and the Command Depot at Knowsley Hall, especially during an influenza epidemic. By Spring 1917 the number of beds had been increased to 65. ​Whilst attached to Oakdene, Edith nursed the sick and wounded and was obviously regarded with much affection by her patients. It seems likely that she travelled to the Pier Head at Liverpool to meet the Hospital Ships and escorted the wounded by train to Rainhill. Edith and the peace of Oakdene must have seemed wonderful to the young men who had endured so much terror, pain and suffering. ​Shown below is Edith's record card. 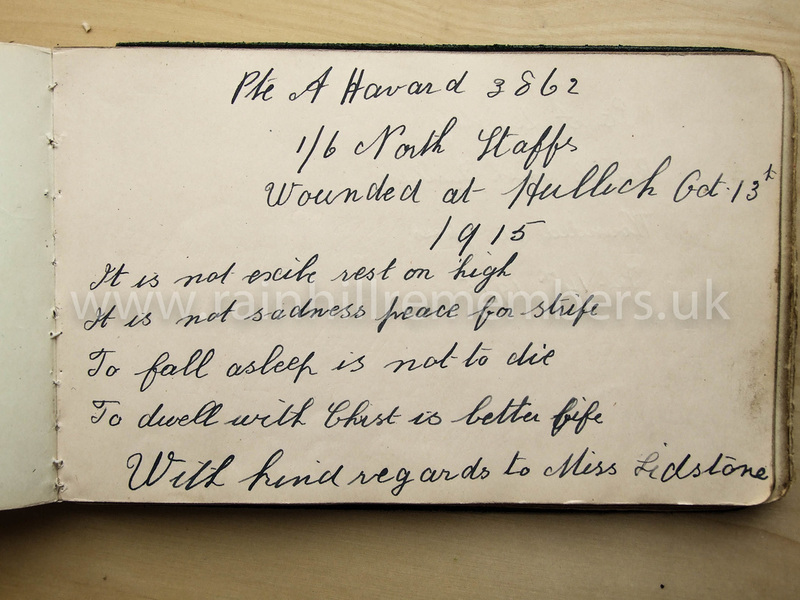 Whilst nursing at Oakdene, Edith began an autograph book to which she asked the patients to contribute. What her motivation was we shall never know. To distract her patients from their wounds? To remember them later? To show their family? What she cannot have expected was that almost 100 years later we are by turns moved, fascinated and intrigued by the glimpse we have into the life and times of Edith, the soldiers and Oakdene. 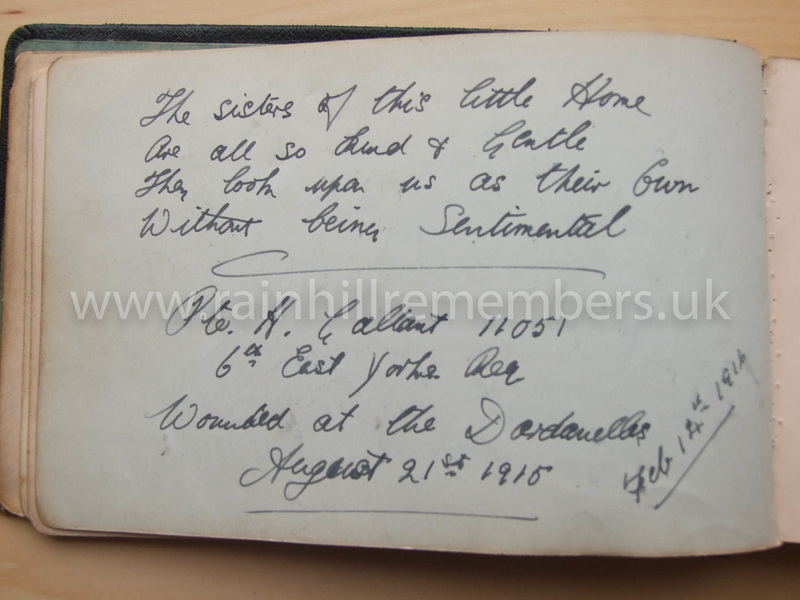 in June 2013, as research started for the 2014 Exhibition, reference was found on the internet to Edith's Autograph Book. Unfortunately the posting was almost 20 years old and emails for further information 'bounced' repeatedly. The names on the website were Walter and Trish Harms and every 'Harms' in the local telephone directories was rung looking for the whereabouts of Walter and Trish without success. Eventually, through the website of the Prescot Roll of Honour, a current email address was found and correspondence entered into. It transpired that Trish and the Autograph Book were in British Columbia, Canada! The story emerged that Edith had died in July 1923 and is buried in St. Bartholomew's Church, Roby. She left the Autograph Book to her elder sister Alice who lived with her brother Alfred at 29 Truro Road, Allerton, Liverpool. Down the road at number 14 lived Jessie Geddes Alleyne. Jessie had lost her brother Alexander Scott Alleyne at the Battle of the Somme in 1916, and we can imagine that the two elderly ladies, both unmarried, spent time exchanging wartime memories. 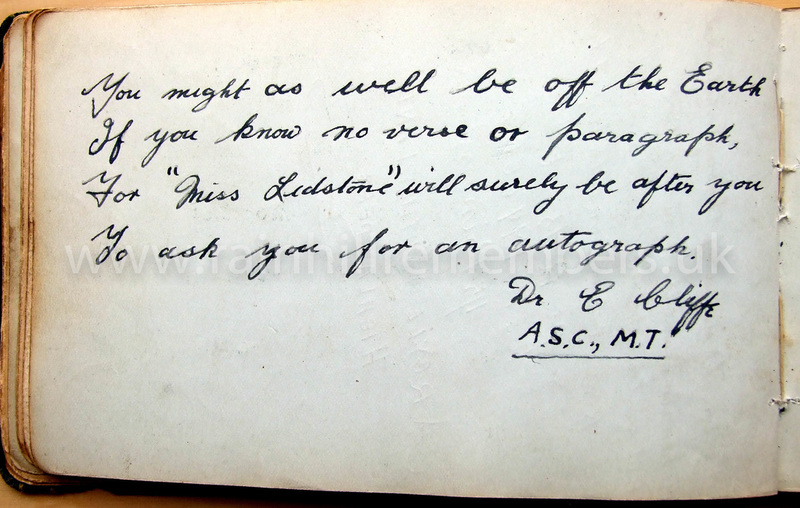 In any case, when Alice died, she left Edith's Authograph Book to her friend Jessie. Jessie died in 1961 and the Autograph Book passed into her family. In the 1990's, Trish Harms in Canada, received the book via a cousin of her maternal grandmother. 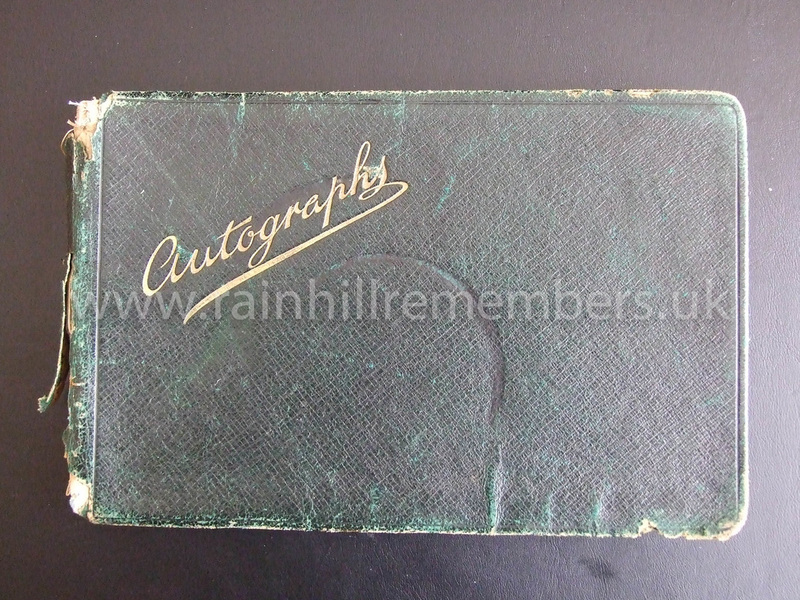 Now the story has come full circle and the Autograph book is back in Rainhill, a few hundred yards from where it started almost 100 years ago! We think Edith would have been amazed and delighted.